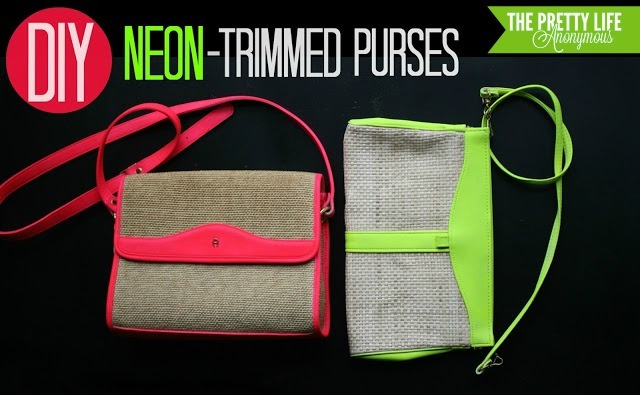 I have a MAJOR obsession with the neon + neutral trend, especially pops of neon on neutral purses. While I was in NYC a few weeks ago, I noticed these bags in the windows of Marc Jacobs and Joe Fresh and wanted to rip those suckers off those boney mannequins and make a run for it. However, I have a habit of changing my purse with the season (sometimes in between) and as a result, I can’t bring myself to spend over $20 on a bag. So, over the weekend I took matters into my own hands and satisfied my neon + neutral lusts by picking up a couple of plain purses from Goodwill ($1.99 each! ), and giving them a major upgrade. Then I painted and painted, a couple of coats on each. After the last coat dried I sprayed the sealant on the bags to protect the paint, let them dry, and that was it! Could you die? SO. Cute. You HAVE to try this one. I mean it. If I catch you at Target looking at neon purses I will surely get all up in your business. A cat-fight may ensue. And, although I will probably lose because I am scared of confrontation, at least you will get the idea that I am serious about you making these bags. Make one! You’ll be obsessed, too.